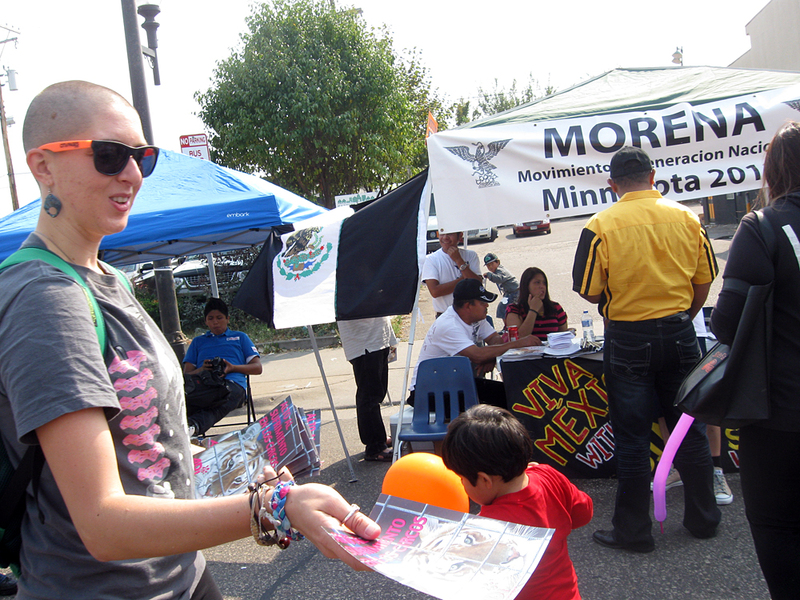 On Sunday, September 16, the ARC Outreach Team passed out literature at the Mexican Independence Day Celebration held along Lake Street in Minneapolis. 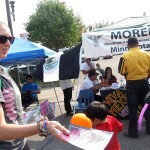 The event attracted a large crowd from the Hispanic community and neighbors in the Phillips/ Powderhorn area to watch the parade and browse the many booths during the six hours of festivities. Team members learned a few quick Spanish phrases from an ARC volunteer beforehand to help relay the message and then passed out over 700 leaflets. The literature included anti-circus leaflets (in Spanish), comic books about being a friend to chickens for the children, and spay and neuter information. The response from the crowd was overwhelmingly positive. 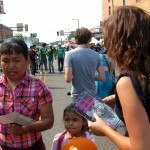 The outreach team also passed out literature this summer in downtown Minneapolis, in Uptown, at events like the Warped Tour, after concerts like Coldplay, Gotye, and Jason Mraz, and at the Minnesota State Fair. 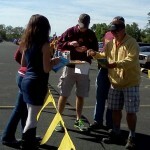 At the University of Minnesota the ARC team helped contribute to a national record for most pieces of literature handed out in one day on a campus. These are just a few highlights of all the events visited this summer by our hard-working outreach team. Many thanks to this dedicated group of activists! 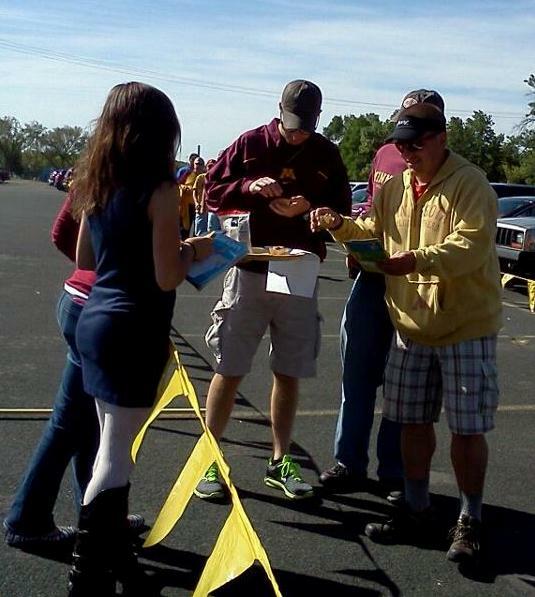 On Saturday, September 8, ARC volunteers gave away hundreds of samples of vegan brats and veggie burgers, everyone’s game-favorite fare, at the University of Minnesota Gopher football team’s first home game of the season. For the second year running, theTofurky Beer Brats with all the fixin’s (ketchup, mustard, relish, and sauerkraut) were delicious and the samples of Gardein burgers flew off the trays as fast as we could grill them. The best part is that the folks we reached were unlikely to have tried vegan food without the encouragement we provided; and they weren’t sorry–we heard many comments about how great everything tasted. 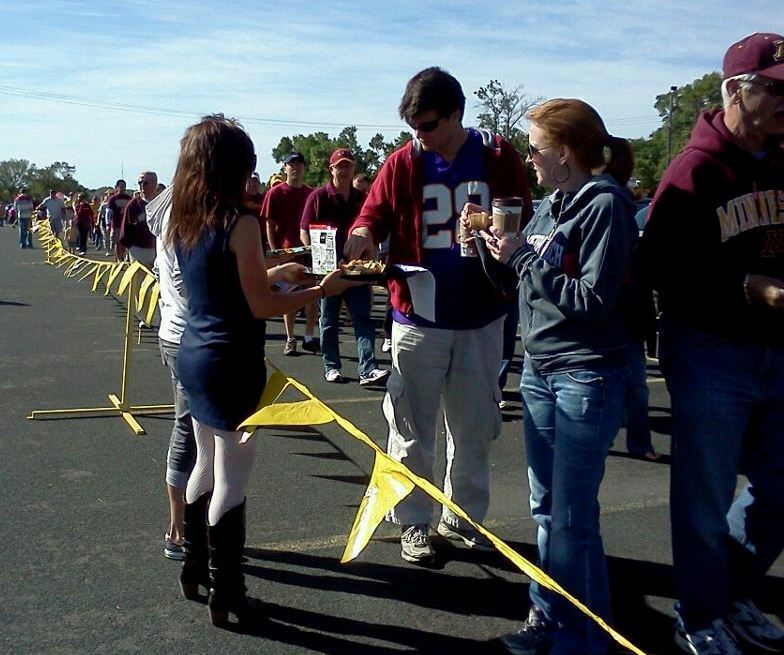 We’ll be back to grill and give away more samples on Saturday, October 13. Thanks to all the volunteers who helped on the 8th, and if you’d like to help out on October 13th by volunteering to grill, pass out food samples, or help answer peoples’ questions about a plant-based diet, contact Dallas. We’d love to have your help! On Saturday, July 28, six members of ARC’s Outreach Team stood outside of the M.A.C store on Hennepin Avenue in Uptown Minneapolis and passed out cruelty-free cosmetic samples to passersby. Along with the cruelty-free samples, they also passed out “Dirty Dozen” cards, which listed the top twelve companies guilty of testing their products on animals. 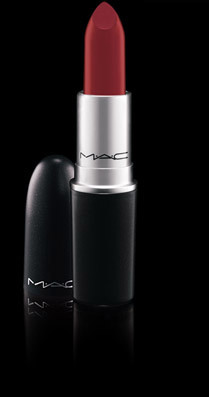 M.A.C, along with its parent company, Estee Lauder, shocked its customers by recently changing from not testing on animals, to testing on animals. This sad fact makes no sense, given the irrelevance of testing cosmetics on species who would never wear cosmetics and the many cruelty-free alternatives to testing on animals. To protest the company’s change in ethics, team members explained to passersby why they were standing in front of the store, what they were handing out, and what people could do to help. They asked passersby to boycott companies such as M.A.C. and suggested where to go to buy cruelty-free products. After all 275 Dirty Dozen cards and samples were passed out within 20 minutes, the team passed out stickers about animal testing and leaflets about animals abused in entertainment and Premarin. The traffic in the area was heavy and the team passed out more than 500 pieces of literature overall, and had many conversations with women who were shocked and angry about M.A.C.’s decision and promised not to go back to M.A.C. as long as they were testing on animals. This outreach event was a huge success and we plan to do another soon! 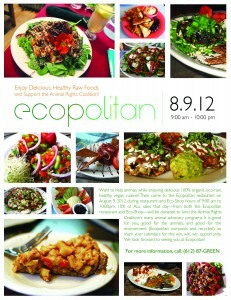 Huge thanks to Ecopolitan restaurant and everyone who came out to support their fundraiser for the Animal Rights Coalition’s many animal advocacy programs on Thursday, August 9. 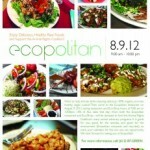 So many people enjoyed Ecopolitan’s delicious organic raw cuisine that the kitchen actually ran out of food! Please continue to visit Ecopolitan, Minnesota’s only 100% organic vegan raw restaurant, bar, and natural home and body goods shop. 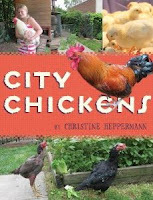 Come on out to ARC/Ethique Nouveau at 317 W 48th St. in Minneapolis on Thursday, July 12 at 6:00pm to hear author Christine Heppermann read from her new book City Chickens, which is all about Minneapolis’ own Chicken Run Rescue, the only urban shelter in the country exclusively for chickens. Christine will be available to chat and sign copies of the book after the reading. 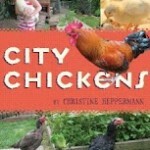 Christine will be joined by Mary Britton Clouse and Bert Clouse from Chicken Run Rescue. Over the years, Mary and Bert have given hundreds of homeless birds a safe place to rest until they can be adopted by caring families. The Minnesota Legislature has created a wolf hunting/trapping season that ignores the 5-year moratorium that was supposed to protect the wolf for 5 years following delisting. The Minnesota Department of Natural Resources (DNR) is accepting comments through June 20th. Anyone may comment – click the “Take the Survey” tab in the fourth paragraph of the second block of text on the DNR Wolf Management page. The survey is biased towards accepting the plan; however, you can leave answers blank and the last question allows you to submit a statement. 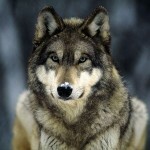 The DNR is proposing that 400 wolves be killed and the use of snares be allowed in addition to legal firearms and archery. 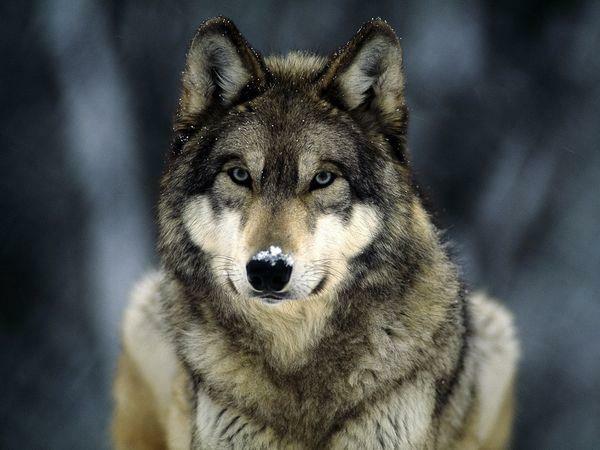 Minnesota’s wolf population (estimated to be 3000 wolves) has been relatively stable for more than a decade with no significant change in the number or distribution of wolves in the state. There is no scientific evidence to support the need for a recreational hunting/trapping season. Third Annual Global Vegan Waffle Party! Update: The Annual Global Vegan Waffle Party just keeps getting better and better! Over 50 people braved the torrential rain in their quest for the perfect waffle and tasty toppings. Thanks to our many volunteer bakers for keeping those waffle irons fired up. And it was great to see all the new faces interested in learning more about a plant-based diet. It’s time for the Third Annual Global Vegan Waffle Party on Saturday, May 26 from 10:00 to 11:30am in the Fuller Park building at 4800 Grand Ave. in Minneapolis (corner of 48th and Grand). 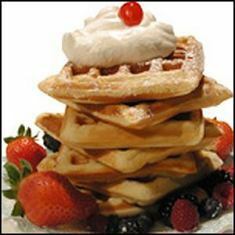 The purpose of the Global Vegan Waffle Party is to promote friendlier, healthier, and more sustainable living via a significant decrease in animal product consumption. A Waffle Party is a fun, non-threatening way to generate broader awareness about where our food comes from and how our food choices affect the world around us. Here’s how it works: We make a lot of vegan waffles. You come to the party with a vegan topping to share. We all eat yummy vegan waffles together! (Here’s some suggestions for toppings you could bring to share: fresh fruit, maple syrup, chocolate chips, peanut butter, fruit sauce, compote, Just Like Honey, coconut, nuts, vegan whipped topping.) It’s also great if you can bring your own plate and utensils because it helps us be good to the Earth. Pound Seizure Now Banned in Minnesota! 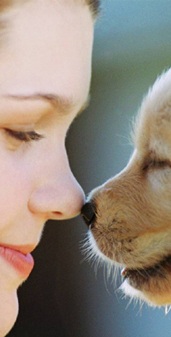 The Animal Rights Coalition (ARC) worked with Howard Goldman, Humane Society of the United States (HSUS) State Director for Minnesota to help bring about passage of this bill. ARC formed End Pound Seizure Minnesota (EPSM), created a web site, obtained thousands of signatures against pound seizure, and brought awareness of the issue to the public through outreach and education. Amy Draeger, attorney and President of EPSM wrote original legislation and conducted historical research on pound seizure in Minnesota. Over a number of years, ARC made numerous requests for information under the Minnesota Data Practices Act to document usage of the pound seizure law. ARC passed on all its research on the issue and its original legislation to Howard, who obtained authors for the bill in the legislature and tirelessly lobbied for its passage throughout the two-year legislative session. Howard was able to meet with past institutional opponents of the bill and persuade them not to oppose it, which was a major step towards successful passage of the bill. We’re so thankful that ARC was able to work with Howard and HSUS in securing this victory for animals in Minnesota – and we’re especially thankful that no longer will lost and unclaimed animals in Minnesota be in danger of being released to institutions for experimentation.